You are commander of the dropship Sentinel. 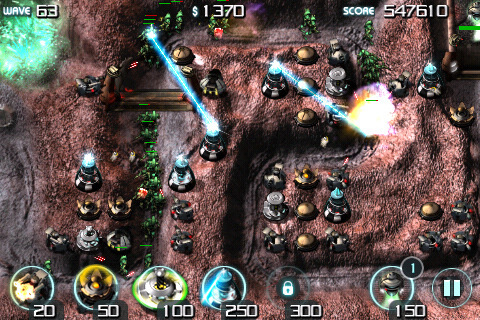 You must defend a distant colony from the alien hordes in this stunning new evolution of tower defense. Protect key structures which block the enemies' path as the aliens smash their way towards your stronghold. Utilize an array of advanced technology including upgradeable towers and droids which can repair buildings or harvest resources. ⁕Tactical and unique gameplay which takes tower defense to the next level. ⁕Use the landscape and destroyable defenses to maximize the effectiveness of your weapons. ⁕Beautifully rendered environments, towers and enemies. ⁕Endurance mode to challenge the most hardened of players. ⁕Compete with players worldwide with the online high score system. View and compare scores seamlessly with the in-game score browser. ⁕Save your progress whenever you want. Automatically saves during a call. If you've played 7 Cities, The Creeps or Fieldrunners then you will love Sentinel. Visit www.origin8.com/sentinel for more information, screenshots, videos and our community forums. Follow us on www.twitter.com/origin8 for updates for all our apps. New in this version - Added a FAST FORWARD button which makes the game play at double speed (for advanced players). - Added a Friend Challenge feature to compete with your friends and try to beat their scores.